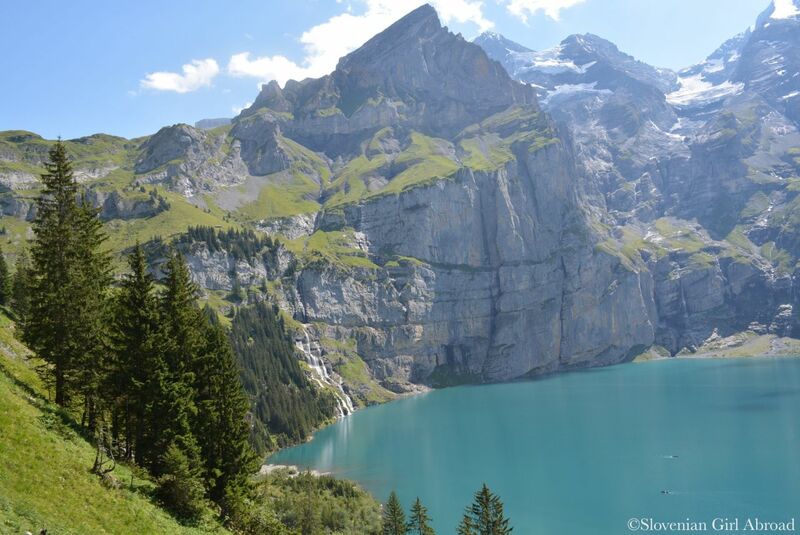 The Oeschinen Lake can be reached by foot from Kandersteg. This hike would takes app. 1 hour. 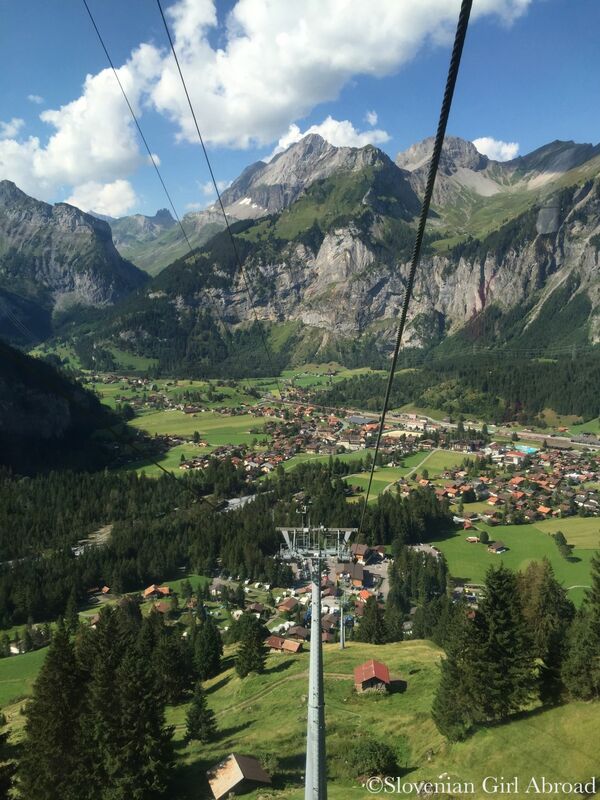 Because my husband and I wanted to do some hiking by the lake, we decided to save time and took gondola lift instead. After a short scenic ride, we arrived at the upper gondola station. From there we walked for app. 20 minutes before we reached the lake. There is also electric car shuttle to the lake (and back) available, but we didn’t use it. The Oeschinen Lake lies at the altitude of 1,578 metres and is surrounded by the majestic mountains covered with glaciers and ancient woods of pine. I have no words to describe the beauty of this place. 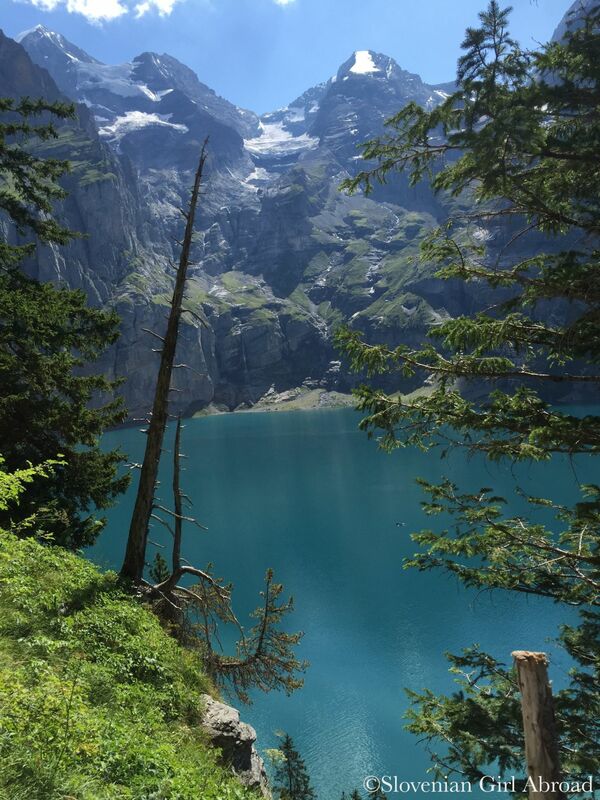 I’ve seen many stunning places in the Alps, but the first sight to the emerald Oeschinen Lake still managed to take to take my breath away. 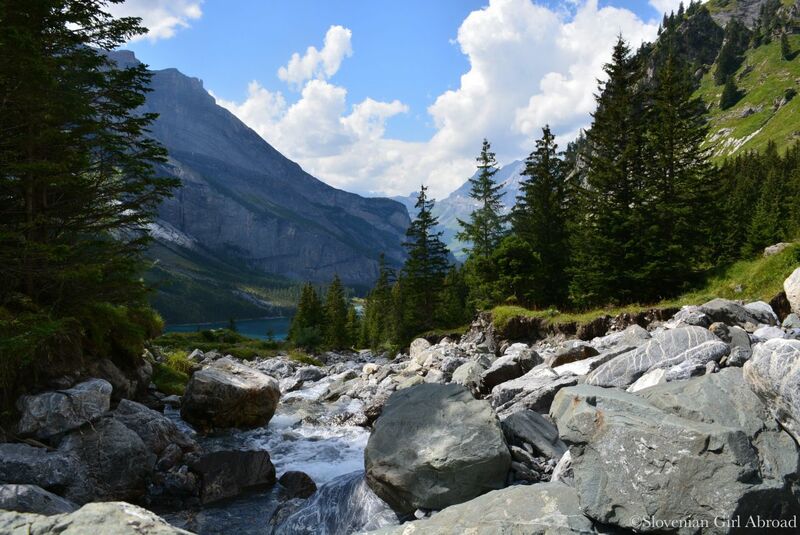 It is most certainly one of the most beautiful and scenic places in Swiss Alps. No wonder, it was included to Swiss Alps Jungfrau-Aletsch UNESCO World Heritage site which stretches across the 824 square kilometres of Bernese High Alps. My husband and I hiked the panoramic trail above the lake. What a beautiful trail that was! 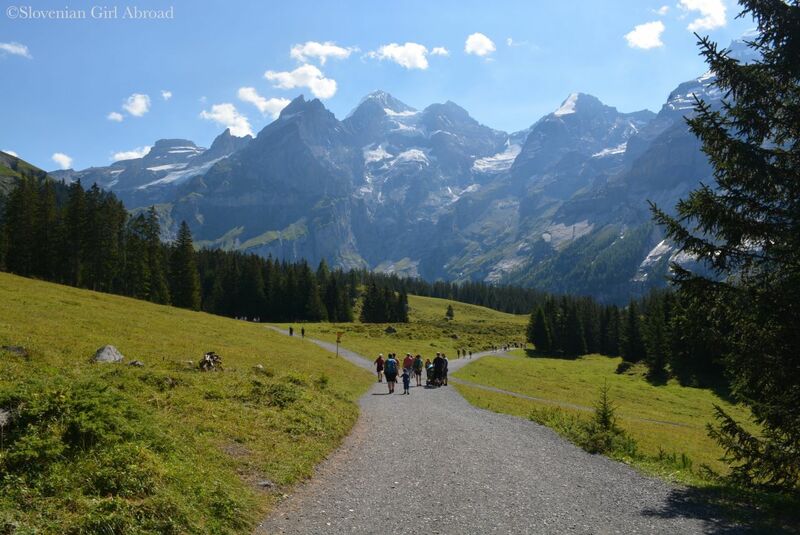 High mountains, glaciers, lake, creeks, waterfalls, green pastures with cows grazing – simply amazing. Views were breathtaking from every single part of the trail. On the way up, we stopped by the creek to rest. We dipped our sore feet in the cool clear water. When we were sitting there and relaxing, a cow came to the creek to drink. Friendly as most of the Swiss cows are, she wasn’t bother by our presence. She drank the water and even allowed us to pet her. Then, all the sudden she turned to our backpacks that were lying on the ground by the water and started to lick them. We rushed to move the backpacks out of her reach, but it was already too late. The straps were dripping her saliva mixed with creek water. Luckily we were by the water so we were able to wash it out. Rested and reacher for the memorable encounter with the cow, we continued our hike. 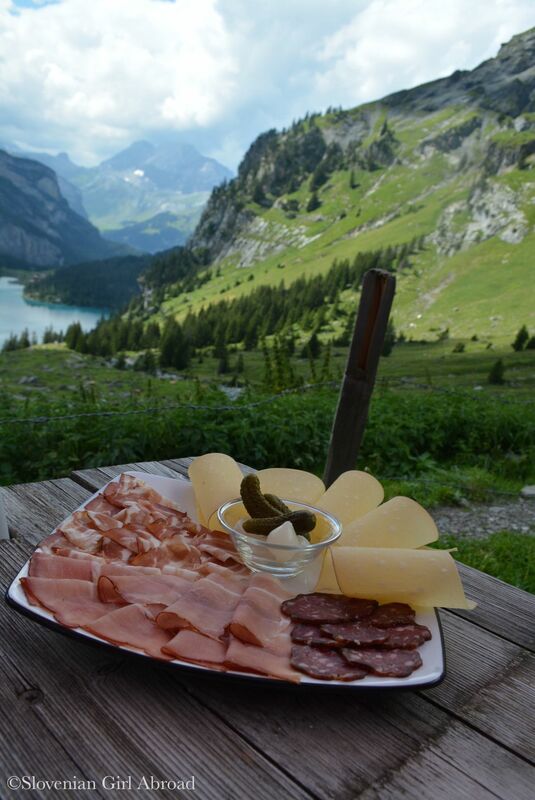 When we’ve reached the mountain hut, we stopped for a quick lunch. Simple platter of locally produced cheese and sausages filled our empty bellies and we were ready to return back to the valley. When we reached the shore of the lake, we stopped and spend some time resting by the lake. It was a hot summer day and the conditions were perfect for swimming. Regrettably we didn’t bring our swimsuits with. We’ve only watched people swam in refreshing crystal clear water. After a rest by the lake, we walked back to the upper gondola station. Before we’ve returned to the valley, we stopped by the summer sled run conveniently located just next to the gondola station. I am usually a big fan of such attractions, but because we purchased the ticket combo where the sled run ride was included in the price of the gondola ticket I did it. It was not the most exciting ride, but it was fun. After the summer sledge ride we’ve boarded the gondola and returned to the valley. Reacher for another amazing experience we drove back our home to Lucerne determined we will return to the Oeschinen Lake soon. HOW TO GET TO OESCHINEN LAKE? 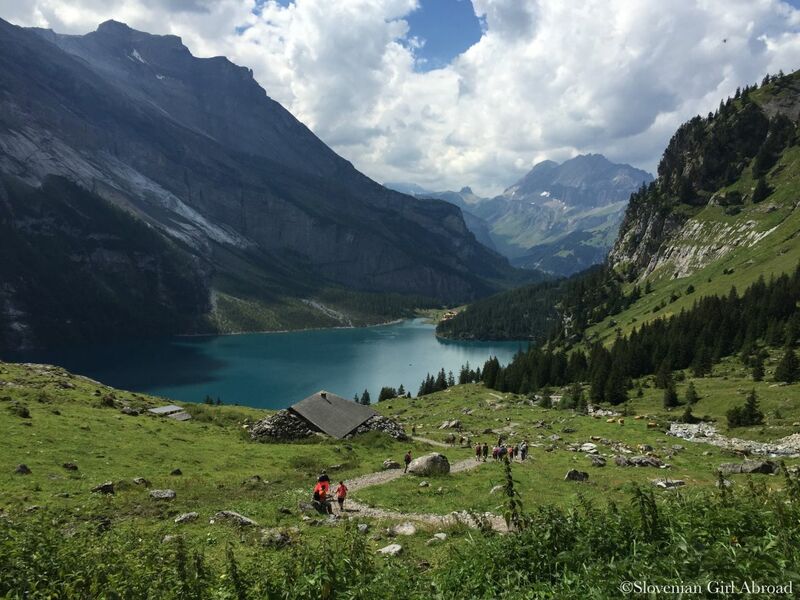 Take the train to Kandersteg. From the Kandersteg train follow the signs to the Oeschinensee (Oeschinen Lake). 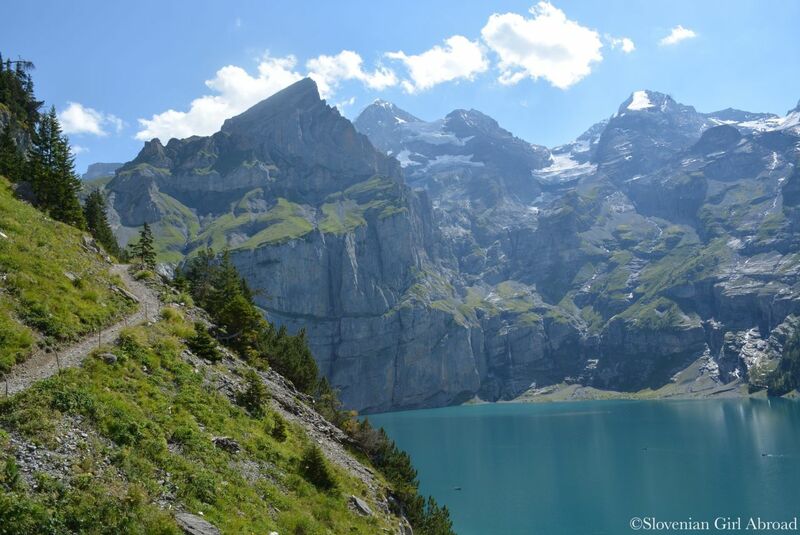 Drive to Kandersteg, then follow the signs to the lower station of the Oeschinensee cable car. We were on this lake a few years ago and it was amazing. Great place! And very cool blog post! Absolutely stunning! And love the lunch with a view! Wow, beautiful! I really want to go to Switzerland! This is such a gorgeous place that words fail me. Your photos really bring out the colours of nature and showcase the stunning scenery! Omg I have this place saved in my maps but every time I see those pics, it takes my breath away! Stunning lake and scenery! Wow Switzerland really is gorgeous! I love gondal rides even though I’m totally afraid of heights but it’s worth for the view, right? And that view on the lake with the mountains in the background is definitely postcard perfect!! Wow! That is one heck of a cliff on one side of the lake! Beautiful photos of an incredibly scenic place that I did not know about – thanks! Aww, that’s SO lovely. It would be great to stay there for a few days and just… be. Yes, staying there for few days and exploring the peacefulness of the area before all the day-trippers come must be amazing. Beautiful scenery! With those impressions we already have a target for next summer 🙂 Thanks for sharing! Beautiful photos…that lake is so blue…amazing! Goodness these photos are so beautiful they don’t look real! Thank you for sharing them! Dang that place looks gorgeous! Nice post. It most certainly was. I can definitely recommend this hike. Oh we’ve been looking at campsites in Switzerland recently so will definitely search for some in this area. It looks such a beautiful place to walk and hike and the gondola stations would certainly help us with our little ones when we didn’t fancy a big hike. Great post and photos. Thanks for joining us on #adventurecalling, i hope you can again tomorrow. 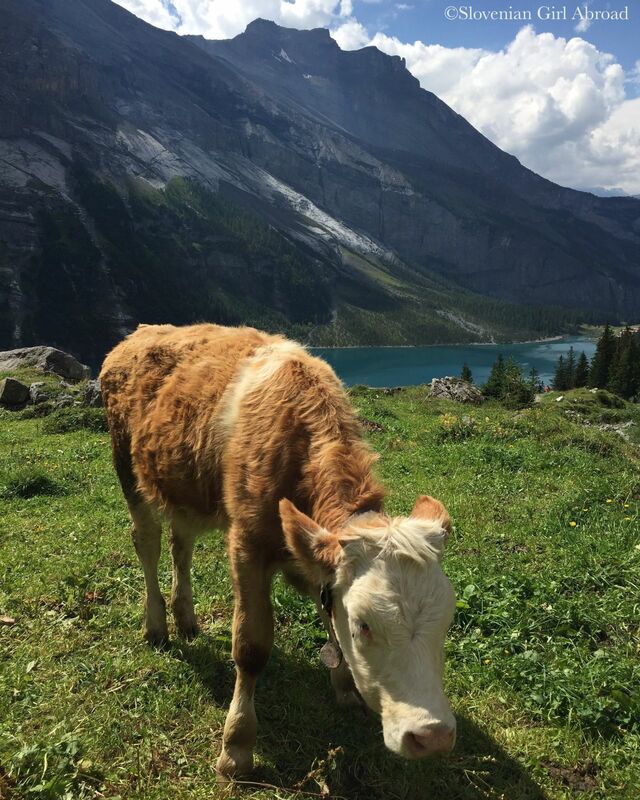 Seems like a great way to spend the day – beautiful weather and views, friendly cows, and a lunch with a view! JAW DROPPING! Swoon! So beautiful Urška! I remember hiking in Switzerland in my 20’s and just loving it. Would love to step out on a hike like this again. Just seriously stunning. Thanks for sharing with #FarawayFiles.